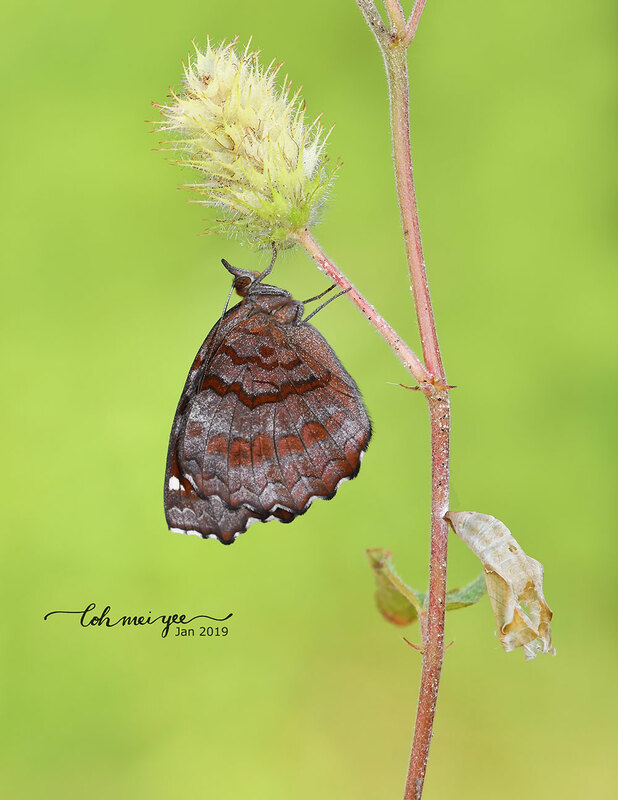 Some time back in mid-Oct 2013, a solitary individual of the Angled Castor (Ariadne ariadne ariadne) was spotted in the Mandai forests in the northern part of the Central Catchment Area. 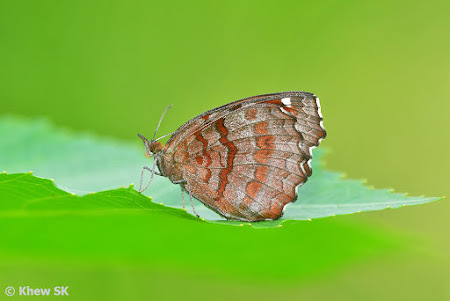 Recorded as a re-discovery over 5 years ago, there were no further sightings of this species thereafter. Until recently, that is. 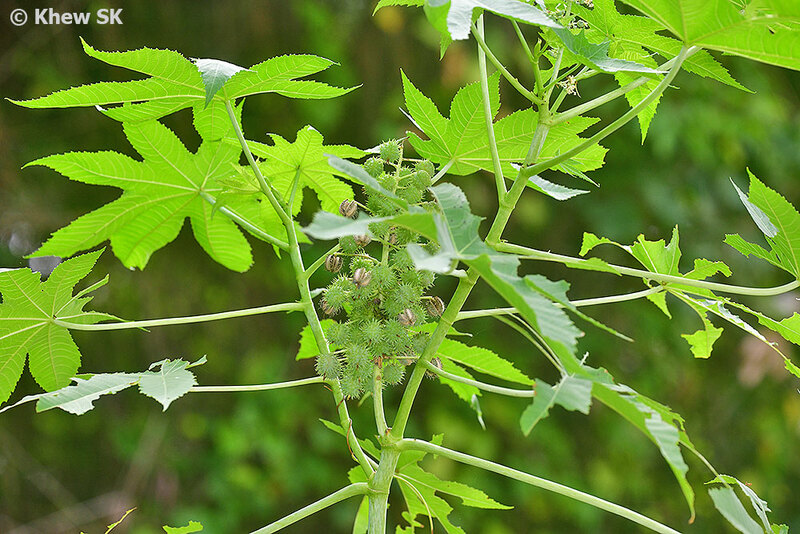 Late last year, the Angled Castor was observed on Pulau Ubin. Then there were more sightings of this species and the pristine condition of the individuals spotted suggested that they were not chance observations of seasonal migrants. This led to the theory that the Angled Castor had somehow managed to sustain a breeding population and that a colony of the species has established itself on Pulau Ubin. Locating this colony was not too difficult, as the Angled Castor is not a rare species in Malaysia and Thailand, where the species can be locally common where it occurs. 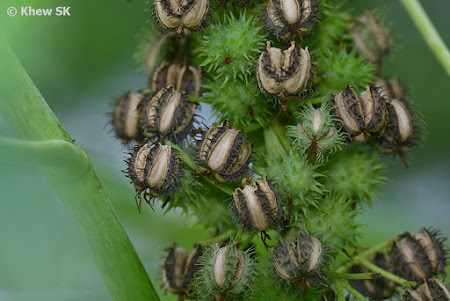 The key is to look for its preferred caterpillar host plant called the Castor Oil Plant (Ricinus communis). 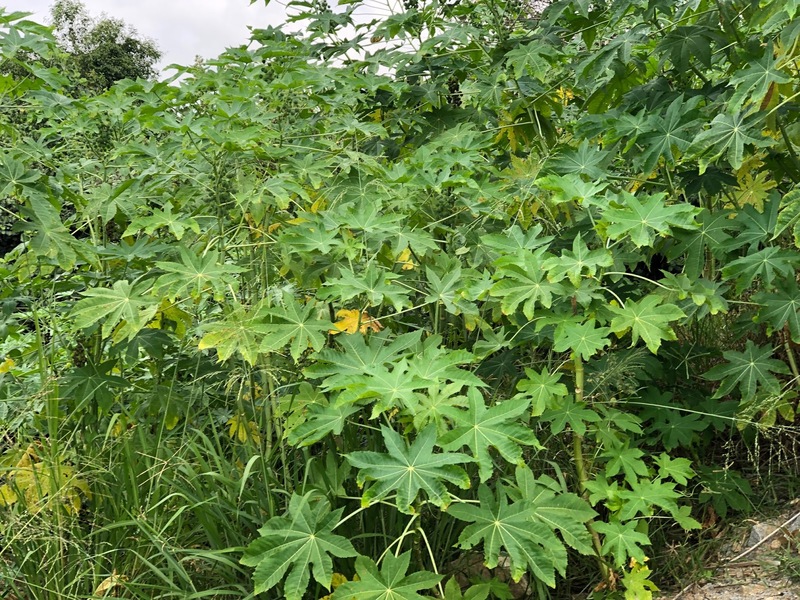 There is a site on Pulau Ubin where after clearance, the Castor Oil Plant grows in abundance. 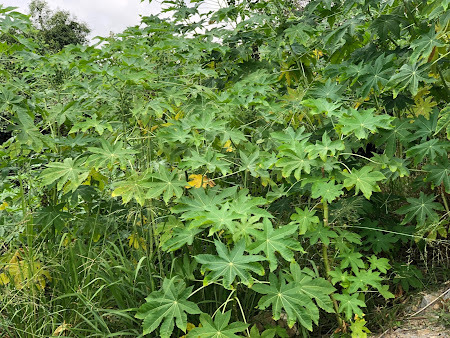 When we visited this area on Pulau Ubin over the weekend, we found that a small colony of the Angled Castor had established itself in the vicinity of the host plants. A rough estimate of at least 30 adults and caterpillars were counted. Two adult female Angled Castors were even observed ovipositing on its host plant. Firstly, let us consider the caterpillar host plant, the Castor Oil Plant. It has been described as an invasive species that colonises wastelands and cleared areas that have been neglected. It tends to form monospecific stands at the expense of other species of native plants and can displace other species due to its aggressive growth and the way the seeds can be distributed. 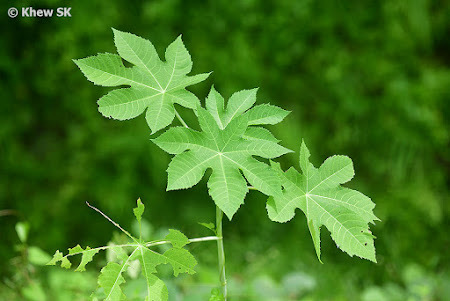 In terms of plant biodiversity, it is considered an unwelcome "weed" that needs to be managed or eradicated. 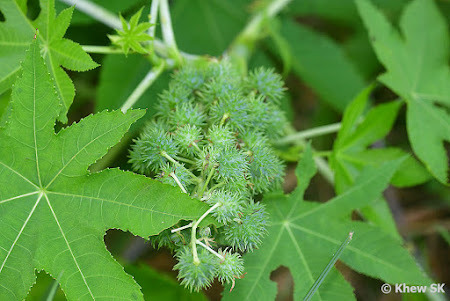 The Castor Oil Plant has a reputation of being a noxious weed and its seeds, if chewed and ingested, can have potentially fatal consequences to humans and animals. One deadly toxin, the notorious ricin is extracted from its seeds. Having been used as a terrorism weapon will not help its case! 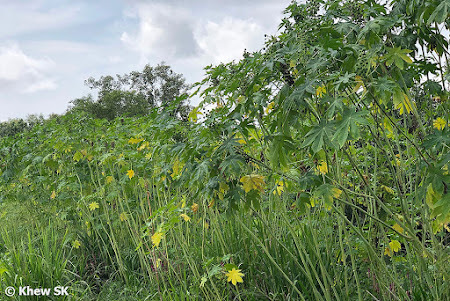 Furthermore, its commercial value of having the seed oil extracted for a variety of uses from cosmetics to lubricating oil and biodiesel does not exist in Singapore. 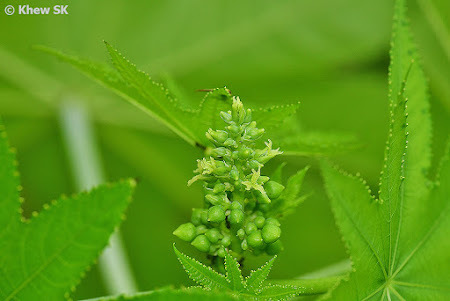 Hence the plant faces the risk of being managed out of the eco-system in favour of other more useful plants. 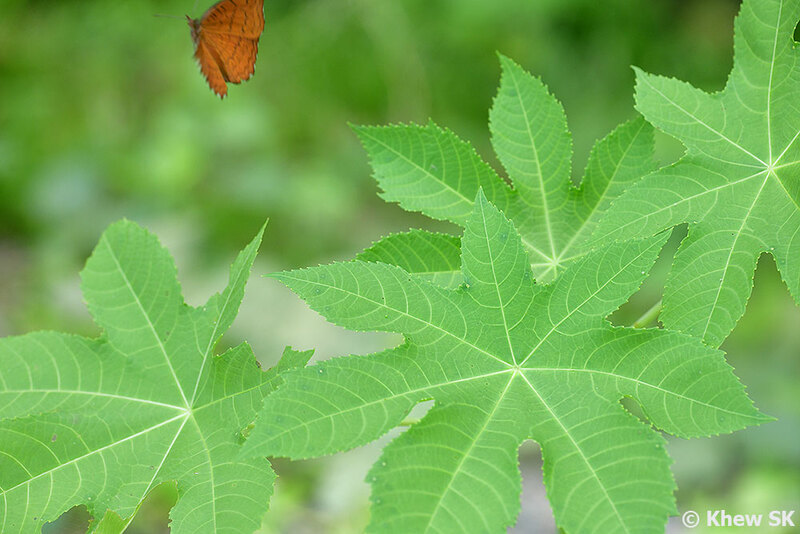 Let us come back to the butterfly that depends on this plant of "ill-repute" for its survival, the Angled Castor. 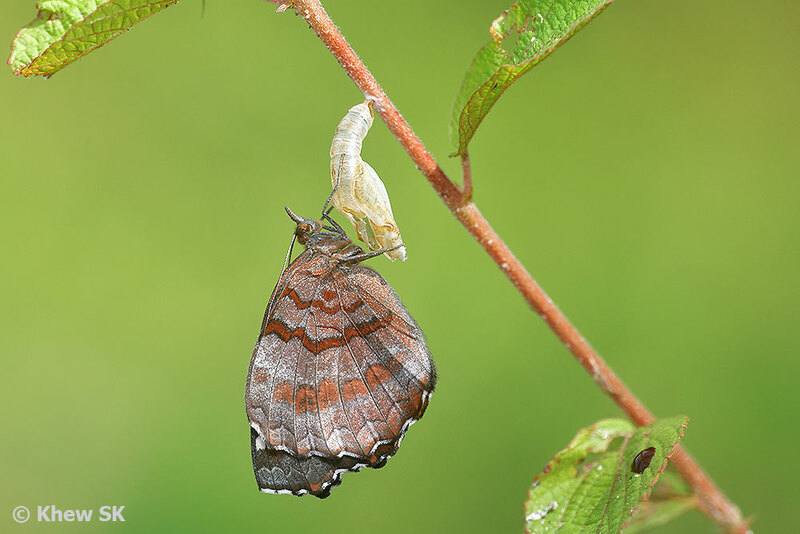 It is likely that a female of the species flew over from nearby Johor where it exists, and managed to oviposit on the host plants that grows on Ubin. 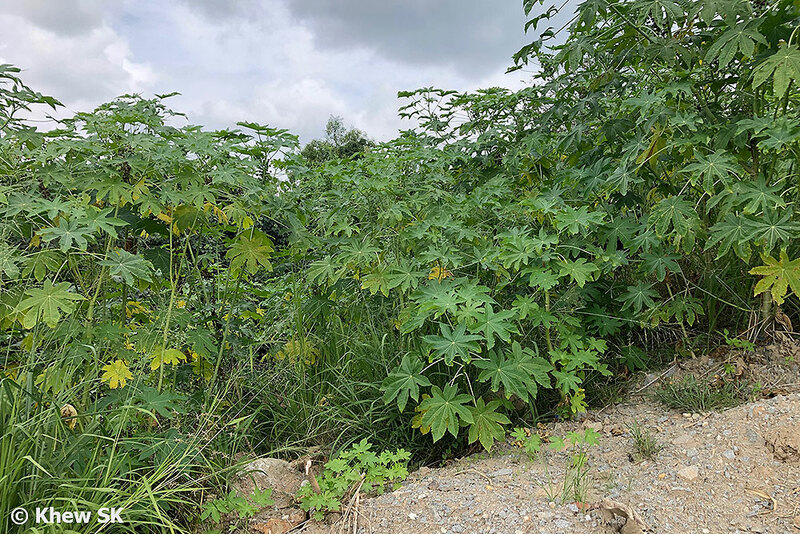 That chance moment then started the next generations of individuals that now populate this area of Pulau Ubin. 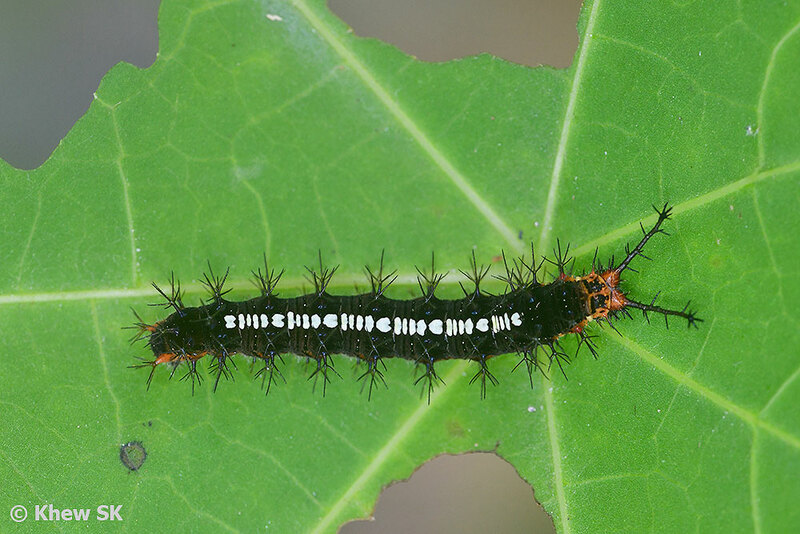 Besides the potential eradication of its caterpillar host plants, what are the other risks to the continued sustainability of the colony of this species in Singapore? Firstly, genetics should be considered. 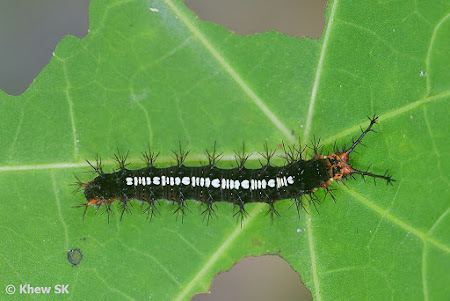 Will this very localised colony suffer from in-breeding and wipe itself out after a few generations? 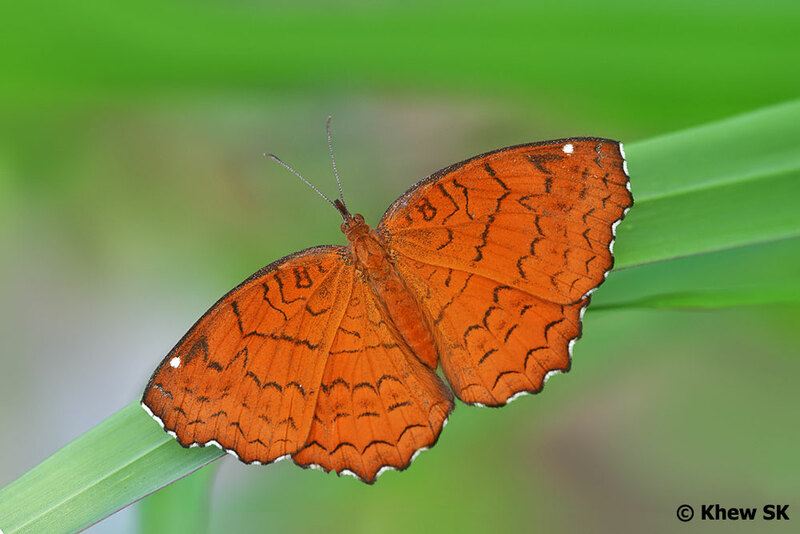 It is known that some species of butterflies are more vulnerable to in-breeding than others. If there are no new genetic material coming into Singapore from up north, can this colony survive? What about predation? 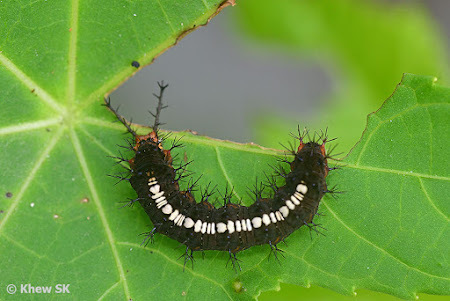 Given that the caterpillars and butterflies of this species are not known to be distasteful to birds and other predators, the delicate existence of this colony may also be wiped out by predation. The caterpillars are also in full view of areas with human activity and may be deemed as pests and eradicated. 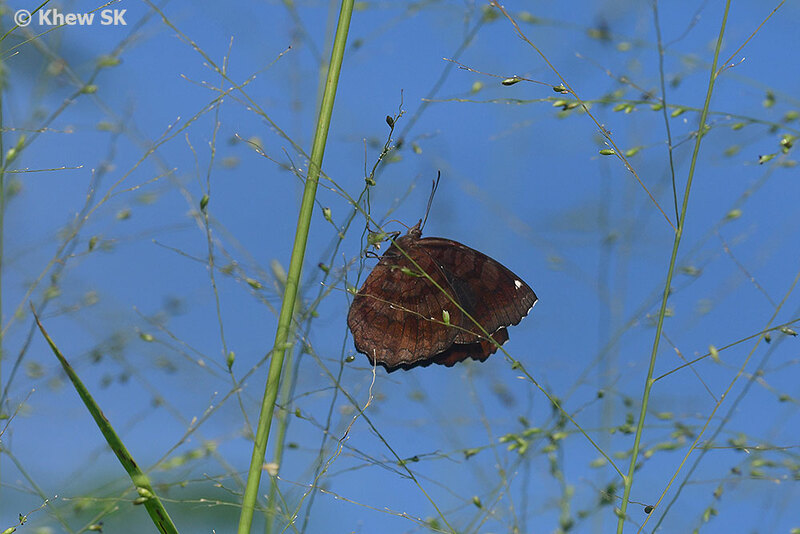 Whilst observing the adult butterflies, they appear to be depending on their sustenance from the flowers of a particular species of wild grass. Several adults were seen feeding on the grass flowers. Other individuals were puddling on the damp muddy areas at the site. 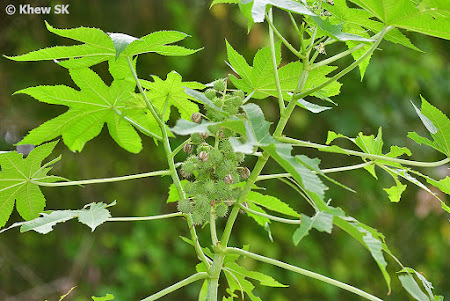 Whilst there are areas nearby with nectaring flowers, the Angled Castor has not been seen beyond the confines of this small area, nor to feed on other flowering plants so far. 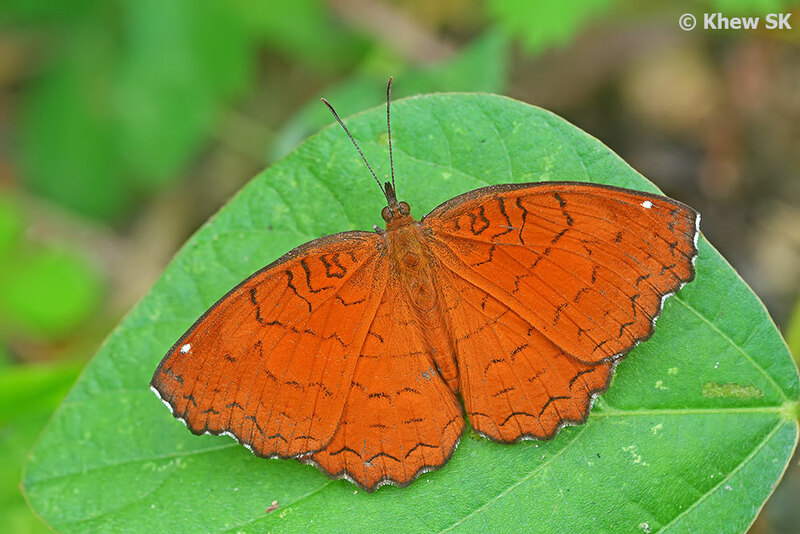 The Angled Castor is the sole representative of the subfamily Biblidinae of the family Nymphalidae in Singapore. 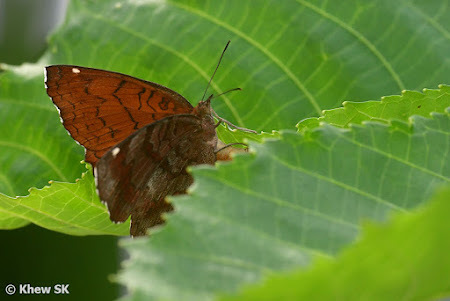 The butterfly is dark reddish brown with thin black squiggly lines on the upperside of its wings. 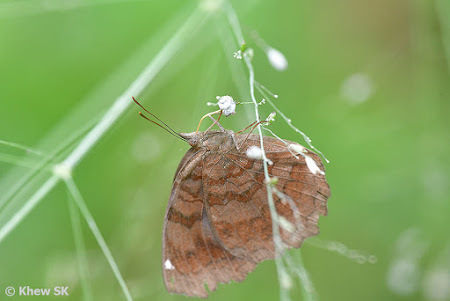 There is a prominent white sub-apical spot on the upperside and underside of the forewing. The underside is a duller brown and similarly streaked with black lines but having a more 'banded' appearance in the darker areas between the lines. The butterfly superficially appears like the Chocolate Pansy (Junonia hedonia ida) and is equally as skittish. Males of the Angled Castor have been observed to engage in 'dogfights', probably in their quest for territorial space. 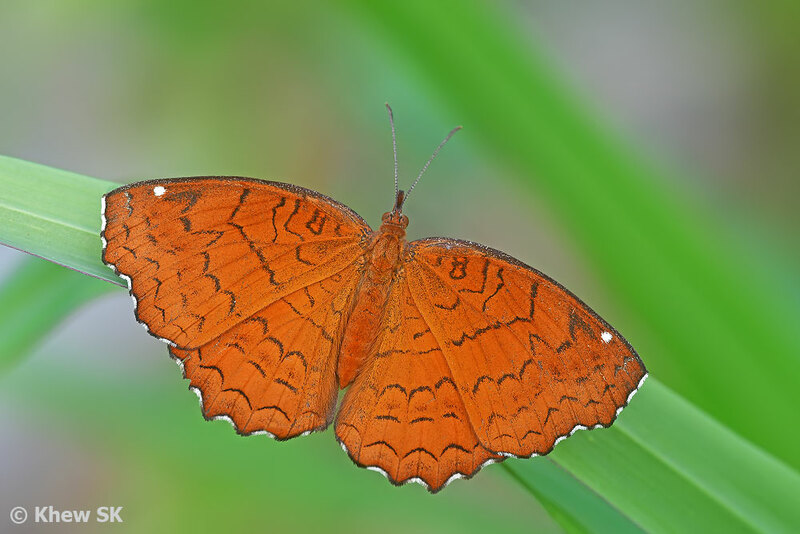 From our observations, the butterflies can fly for long periods of time with occasional stops to rest with their wings opened flat. 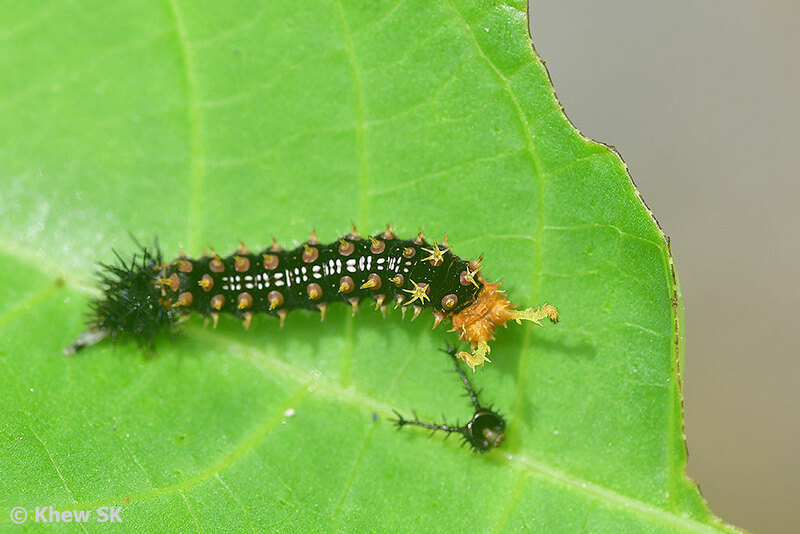 At the Ubin site, several instars of caterpillars were found on a single host plant, suggesting that the eggs have been laid at different times over the past month or so. A newly-eclosed female was chanced upon, still hanging onto its pupal case. 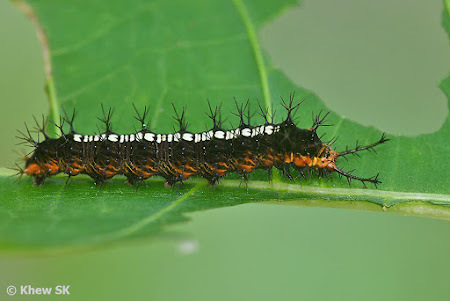 From the number of individuals observed this weekend - both pristine and tattered/weathered adults, it is obvious that the colony has been thriving at this location for the past few weeks, if not months. 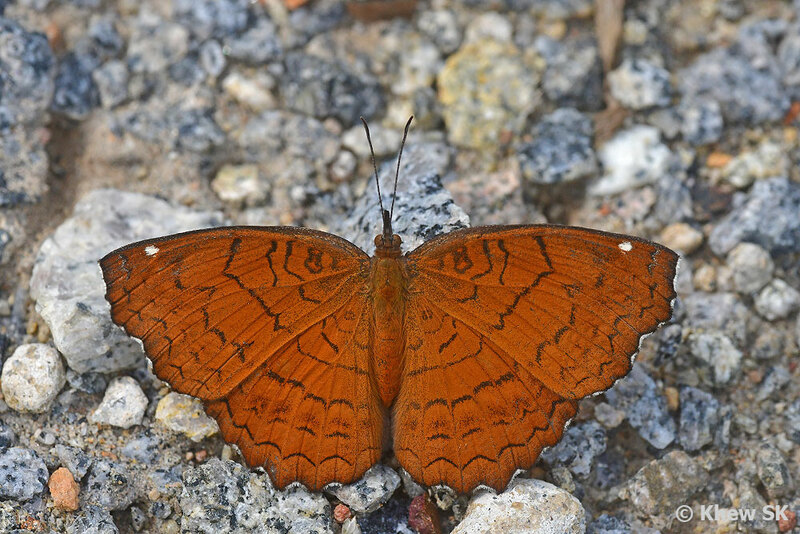 For a species that is considered a "very rare" seasonal migrant to Singapore, it is now "very common" at this localised area on Pulau Ubin and from the breeding population, it can be now be assumed to be an extant species here. The status of various species can change from time to time, depending on circumstances and ecological and environmental changes that affect their existence in a country. 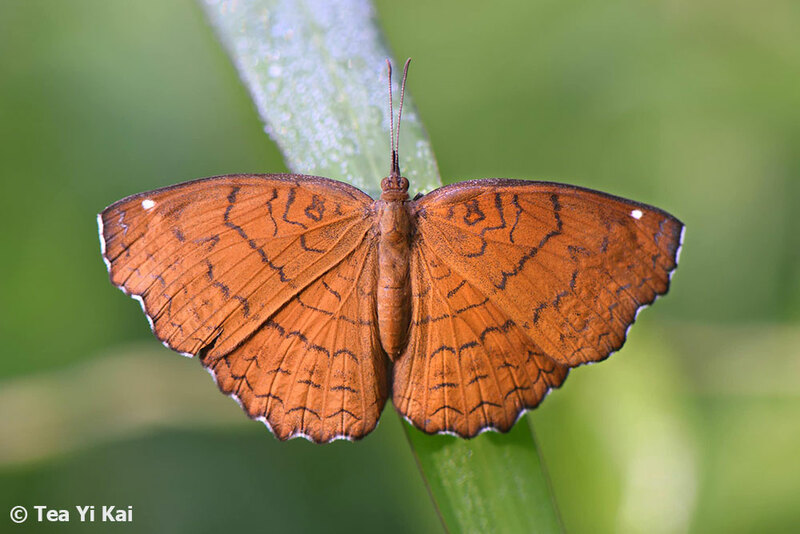 It remains to be seen for how long this re-discovered species can continue to survive in Singapore, and whether natural or human-initiated threats affect this colony in the longer term. Text by Khew SK : Photos by Khew SK, Loh Mei Yee and Tea Yi Kai.